Bright green moss and dewy ferns filled the understory, while a thick fog engulfed the treetops. Through the mist, I could make out craggy mountains with over a dozen waterfalls cascading down the sides. Farther ahead, the deep azure blue of a glacier peaked out from the summit of a rocky pass. If I were blindly dropped off in this location, I wouldn't know where on earth I was. That's the thing about Norway. One moment you're comparing the beauty of the mountains to Alaska or New Zealand, or the vibrant foliage to the US Pacific Northwest - the next, you're at a loss for words as the landscape unfolds into something you've never seen before anywhere in the world. The centerpiece of this majestic landscape is the fjords: deep, brilliantly blue inlets carved by glaciers from interior valleys to the sea. Most hikes feature stunning views of these unique geomorphological features, while the best ones also offer vistas of glaciers and snowcapped peaks. Here are some of the most breathtaking hikes in southwestern Norway, most of which are featured on Backroads' Norway Walking & Hiking Tour. The Nali hike begins in Stalheim, near the popular Stalheim Hotel. It winds along the Stalheimskleiva, overlooking the beautiful Nærøydalen valley. Trail-wise, this is about as easy as it gets here, with little elevation gain and just over three miles of hiking. But the cultural component makes this a must-see spot. Oh, and the dramatic views of the Nærøydalen landscape, with domed mountains and waterfalls, aren't bad either. Make sure you visit Randi at Sivle Gard farm for the best authentic Norwegian food, stories and laughter. Have you ever wanted to hike across the striking blue surface of a glacier? This is your chance to do exactly that! Nigardsbreen is part of the Jostedalsbreen, the largest glacier in continental Europe. Not only is it one of the more accessible arms of this giant ice-mass, it's one of the most stunning, with clear walls and deep blue hues visible from vertical crevasses. Worried about slipping? Your guides will give you crampons for that, making a walk on a glacier feel more like a walk in the park - an awe-inspiring park made of ice. Located just outside the 'booktown' (every shop in the town sells books, in addition their other wares) of Mundal in Fjaerland, this hike begins leisurely before gradually morphing into a more challenging climb. The trail leads into an alpine meadow, with views of waterfalls on all sides and a sense of peacefulness brought about by the quieting walls that surround the meadow. One of the more challenging hikes in the region, Flatbrehytte is not overly difficult in a technical sense - it's just two-to-three solid hours of steady incline as you wind up a gorgeously forested slope. There's a surprise reward at the top of the trail loop, where a mountain hut beckons to you to take shelter from the cold or to simply relax and enjoy a quick lunch. There's also surprise giant slab of ice that greets you upon your rounding of the final bend. 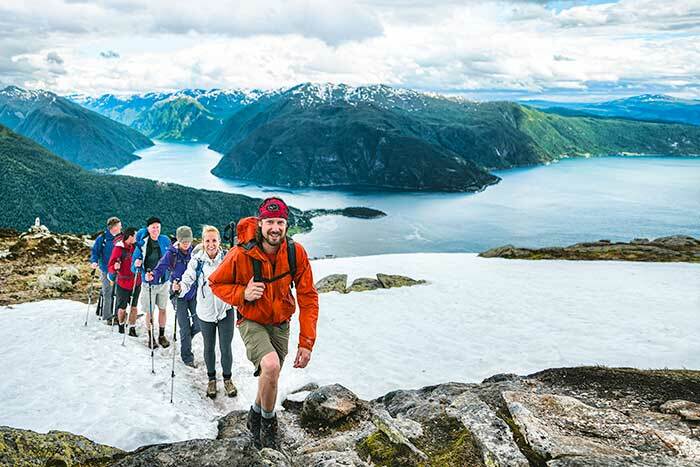 Situated in the heart of Sognefjord, the largest and deepest fjord of them all, the Burasi hike and Raudmelen extension offer unparalleled views of sapphire waters on both sides of the trail. The town below, Balestrand, was chosen by the country's artists as a settling place because of the ever-changing sceneries created by low-hanging mists that cover the fjord and dissipate, sometimes several times per day. Picturesque is not a strong enough descriptive word for this town and its surrounding trails. If you've ever seen an image of Norway with somebody perched on a rock high above a fjord, chances are it's Trolltunga. The hike itself is beautiful, equal to any of the others mentioned above. But it's the massive stone slab jutting over the fjord in the most dramatic fashion that makes this one of the most well-known places in the entire country. No matter which hikes you choose, or which historic farming towns, fishing villages or fjord-side viewpoints you explore, Norway is a truly special place that will leave its imprint on you. Whether you're an experienced hiker or just getting started, there's something for everyone here. As the old Norwegian saying goes: "Alle meistrar er fødde, men ingen er fødd meister så nær som bukken" - All masters are born, but none is born a master except the billy goat.